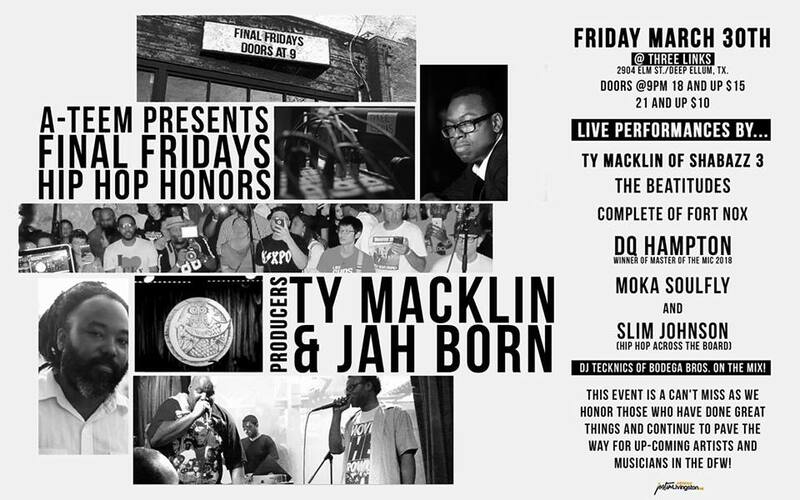 PRODUCERS TY MACKLIN & JAH BORN! 2904 ELM ST./DEEP ELLUM, TX. DJ TECKNICS of BODEGA BROS. on the mix! TY MACKLIN is a storied producer of our DFW scene dating back to the early 90’s where he was the focal producer of his group SHABAZZ 3 which featured FATZ and BOBBY DEE on the mix. They released an album called “LATE NITE W/SHABAZZ 3” which is considered a classic still today. TY has produced songs for ERYKAH BADU on BADUIZM and on RED BULL presents SOUL SOUNDS. He also has worked with INDIA.IRIE and has mixed countless songs and albums for many local hip hop artists and musicians over the years like EPATOMED/JURAH JAHVEH and CASSIE HOLT & THE LOST SOULS. JAH BORN produced ERYKAH BADU’S lead off classic single “ON & ON’ off the BADUIZM album and has most recently been a member for her experiment band “THE CANNABINOIDS”. Most recently he performs weekly with RC & THE GRITZ band @ The Prophet Bar on Wednesday night Soul Sessions. He has been touring with his his own band THE BEATITUDES and will perform with STONE MECCA & RZA of WU-TANG CLAN fame. They will be performing @ THE FORTRESS FESTIVAL in April. He also has started a production company along with his partner Rob-Ski called GALAXY9 which continues in the vien of bringing good events and shows to the DFW. This event is a can’t miss as we honor those who have done great things and continue to pave the way for up-coming artists and musicians in the DFW!